Total elongation: Amount of elongation in 2 in. as necking begins to tear. Forming-limit curve: Defining how close deformation is to failure (see diagram). By the early-1990s, computerized forming simulation or virtual forming emerged with great success. Tremendous time and money were saved by conducting part design, die design, product capability and other tasks on the conputer. However, the output was only as good as the quality of the steel properties and the FLC data. 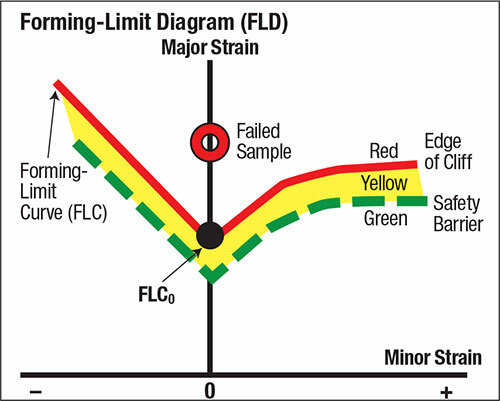 FLC for deterring the severity of deformation at different locations in a stamping. The biggest upset to properties came with introduction of advanced high-strength steels (AHSS). Previous steels had only one metal phase in their micro-structures. This phase was ferrite, created with atomic cells consisting of nine iron atoms. The original source is the molten metal in the steel mill that is poured into various solidifying processors to form steel coils. “Why should there be only one phase in the microstructure?” asked metallurgical researchers. Research led to creation of the first two-phase steel, called dual-phase (DP). Ten-percent martensite (MS) balls were introduced into the ferrite base. As deformation begins, the ferrite and martensite interact with each other to create higher n-values. This good news allowed DP steel to restrain the early growth of local strain gradients. Unfortunately, the n-value is not constant and must be plotted as an instantaneous n-value graph. Further research led to transformation-induced-plasticity (TRIP) steel that allowed creation of higher n-values over the complete deformation time of the sheetmetal. ‘Designer steel’ frequently was the name attached to this material. The high n-values are held in reserve. Strain transforms the retained austenite to MS. If the steel has low carbon-retained austenite, the transformation will take place when the metal is formed into the part. If high carbon-retained austenite is available, no transformation takes place when forming the part but is used to absorb energy during a car crash or other high-energy event. The current operating system includes the use of nano-sized particles. Using the large MS balls for DP and TRIP steels too often causes an unwanted reaction in the steel. Edge cuts, notches, holes and other locations of shearing induce coldworking, thereby reducing formability and initiating cracking, broken edges, change in part shape and other forming barriers. The nano programs replace each large MS ball (such as found in DP products) with huge numbers of nano-sized MS particles. These particles protect their surrounding areas and link with neighbor particles. Some major universities are now undertaking ‘nano projects’ as the next major advancement in metallurgical science. My concern: Most applied research for sheetmetal forming is found in the press shops—developing part designs, die designs, running presses, using welding equipment and many other assignments. The old days of identifying material characteristics and properties by yield strength, tensile strength and total elongation are long gone.